Our PLC prices are hard to beat! The DirectLOGIC 405 PLC process control system from Koyo packs a lot of power for its size and price. It is one of our most powerful PLC applications. The DL405 PLC control system has the one of the widest varieties of I/O modules and configurations of all our DirectLOGIC PLCs. 4 Slot I/O Base - 4-slot local or expansion base; allows specialty modules in expansion bases when used with D4-450 CPU. 6 Slot I/O Base - 6-slot local or expansion base; allows specialty modules in expansion bases when used with D4-450 CPU. 8 Slot I/O Base - 8-slot local or expansion base; allows specialty modules in expansion bases when used with D4-450 CPU. 8 pt Isol Relay Output 10A - 8-point 12-30 VDC or 12-250 VAC isolated output module, 4 Form A (SPST) and 4 Form C (SPDT) relays, 8 commons (isolated), 10A/point, 40A/module, removable terminal. 16 Pt Relay Output - 16-point 5-30 VDC or 5-250 VAC output module, 16 Form A (SPST) relays, 2 commons (isolated), 1A/point, 5A/common, removable terminals. 4 ch Analog Input - 4-channel analog input module, 12 bit resolution, ranges: 0 - 5V, -5V to +5V, 1 - 5V, 0 -10V, -10V to +10V, 4 - 20 mA, 0 - 20 mA. 4 ch Isol Analog Input - 4-channel isolated analog input module, 12 bit resolution, ranges: 0 - 5V, 0 - 10V, 1 - 5V, -5V to +5V, -10V to +10V, 0 - 20mA, 4 - 20mA. 8 ch Analog Input - 8-channel analog input module, 12 bit resolution, ranges: 4 to 20mA, 1 to 5V, 0 to 20mA, 0 to 5V, 0 to 10V, -5V to +5V, -10V to +10V. 16 Ch 4-20mA Analog Input - 16-channel analog input module, 12 bit resolution, range: 4 to 20mA. 16 Ch Voltage Analog Input - 16-channel analog input module, 12 bit resolution, ranges: 0-5V, 0-10V. 4 ch Analog Output 4-20ma - 4-channel analog output module, 12 bit resolution, range: 4 to 20mA. 4 ch Analog Output Voltage - 4-channel analog output module, 12 bit resolution, ranges: 0 to 5V, 0 to 10V, -5V to +5V, -10V to +10V. 4ch Isol Analog Output 16 bit - 4-channel analog output module, 16 bit resolution, isolated, range: 4 to 20mA current sourcing. 4 Ch Voltage Isolated Output - 4-channel analog output module, 16 bit resolution, isolated, range: 0-5V, 0-10V. 8 ch Analog Output 4-20ma - 8-channel analog output module, 12 bit resolution, range: 4 to 20mA. 8Ch analog output mod. - 8-channel analog output module, 12 bit resolution, range: 0-5V or 0-10V. 16 ch Analog Output 4-20ma - 16-channel analog output module, 12 bit resolution, range: 4 to 20mA. 16Ch analog output mod. 12 bit - 16-channel analog output module, 12 bit resolution, range: 0-5V or 0-10V. Modbus Master Module - Modbus Network Master module, Modbus RTU Protocol, provides block read/write and high speed table driven polling, up to 115,200 baud, cable not included. Current Trans. use with F4-4LT - Current Transformer for use with F4-4LTC to detect heater burnout. DL405 Installation Manual - DL405 Installation and I/O Manual. Covers installation and wiring, plus specifications of all discrete I/O modules. RLL Plus handheld programmer - RLLPLUS handheld programmer, provides programming, testing and monitoring for all DL405 CPUs, including the D4-450 CPU. 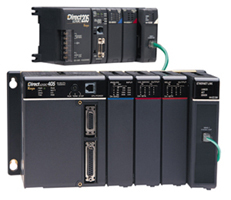 You can build a PLC controller system with local/distributed I/O of up to 3,500 points. Use the built-in PID instruction or specialty modules to perform cost-effective process control. PID (Proportional, integral, derivative) control: The control algorithm that is used to closely control processes such as temperature, mixture, position, and velocity. The proportional portion takes care of the magnitude of the error. The derivative compensates for the rate of error change. The integral takes care of small errors over time. Use our ZIPLink pre-wired I/O cables and connector modules for easy wiring, especially to our 64-point DC modules. Our analog I/O selection will give you the flexibility you need to perform low-cost process or data acquisition applications. We have 4, 8 and 16-channel models with input and output ranges such as 4-20 mA, 0-10 V, and bipolar ranges; isolated or non-isolated, 12 or 16-bit, thermocouple, RTD and millivolt modules. For example, our 8-channel F4-08AD analog input module offers eight channels of analog inputs and supports 4-20 mA, 0-20 mA, 0-5 V, 0-10 V, 1-5 V, +/-5 V, and +/-10 V (seven ranges) for a low price. For high-density analog, our F4-16AD-1 module supports 16 channels of current inputs at a low per-point cost. NOTE: New option modules may not be supported by CPUs purchased prior to the modules release. For further details or specifications, select the desired product category and then select the "Products" tab and click on the product "Item Code" link, or select the "Technical Info" tab. It supports all five DirectLOGIC families of PLCs simultaneously, including all DL05s, DL105s, DL205 CPUs, DL305 CPUs, DL405 CPUs, and most of their Koyo cousins. It supports an incredible array of on-line/off-line programming and documentation features. Use the PID screens for fill-in-the-blank setup and loop tuning.